Noki Lock With Noki technology, the ultra secure electronic locking system, say goodbye to conventional locks and lost keys. Available on the majority of Artopex metal storage units and standard on all Air Line storage units. Our Artopex dealer Lynne Lemieux can help you with your requirements. 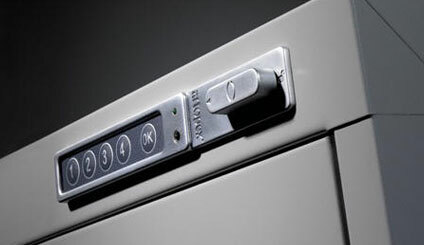 The Artopex Noki locking system is extremely popular with my clients. No longer do they have to contact me to order keys or hire a locksmith should they lose them. All of my Artopex customers are concerned with privacy issues and each individual user can have their own code. I highly recommend the Artopex NOKI feature in any office or home office environment. The Artopex Noki lock system is a facility manager’s answer for lost keys, Artopex’s answer to contributing to the environment and my clients answer to lost keys.